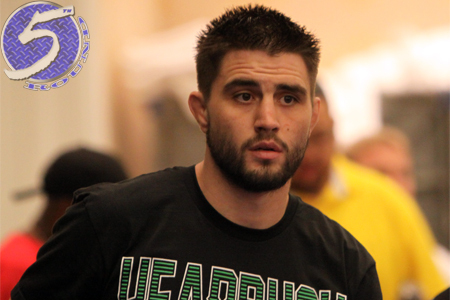 As expected, a welterweight showdown between Carlos Condit (Pictured) and Josh Koscheck will take place February 4th at UFC 143. The pivotal 170-pound scrap was confirmed by the organization on Tuesday. Condit owns an impressive 27-5 record and is perfect through his last four scraps. “The Natural Born Killer” knocked out Dong Hyun Kim at UFC 132 this past July. Koscheck was last seen putting Matt Hughes down at UFC 135 in September. The victory marked Kos’ first fight since suffering a broken orbital bone in a UFC 124 loss to champion Georges St-Pierre. Condit was slated to challenge St-Pierre for his crown at UFC 137, but knee and hamstring injuries forced GSP out just 18 days before showtime. Their scrap was expected to be rescheduled for early next year until Nick Diaz dropped his two cents on the subject. Diaz leapfrogged back into the championship affair against St-Pierre after beating BJ Penn and putting GSP on blast. UFC president Dana White promised Condit will get next dibs at the belt should he beat Koscheck. No word on what’s in store for Kos if he reigns supreme. The Mandalay Bay Events Center in Las Vegas, Nevada is expected to host the shindig. St-Pierre vs. Diaz headlines the pay-per-view broadcast.